Want to know what painting safety equipment you should buy? Then, you are on the right page! House Painting Safety – You’ve heard the words before… Safety comes first. The proper use of ladders, masks, respirators, protective glasses or goggles is all an important part of tackling the various aspects of house painting. 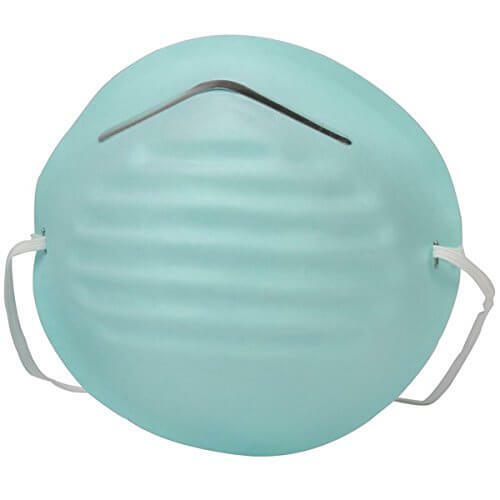 Protective glasses, masks, and respirators belong in a toolbox as much as pliers do. 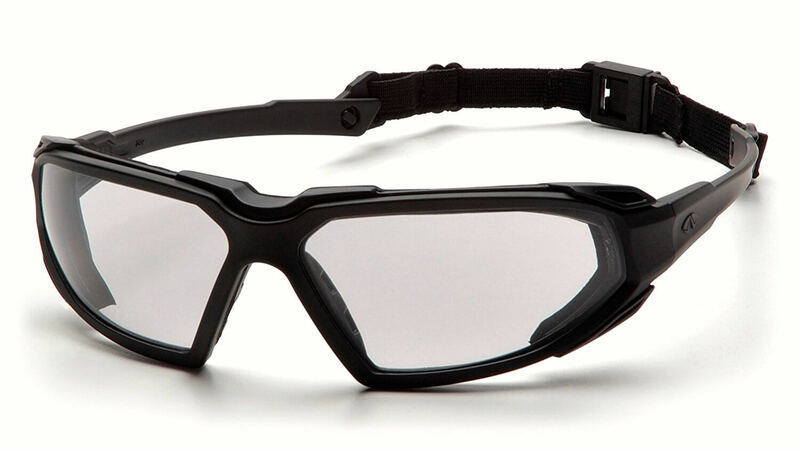 Safety goggles guard your eyes against flying particles and liquids – but not against fumes. Wear goggles while sawing, drilling, sanding, wire-brushing, planning, or spray-painting. They won’t fog up if they have ventilation holes. 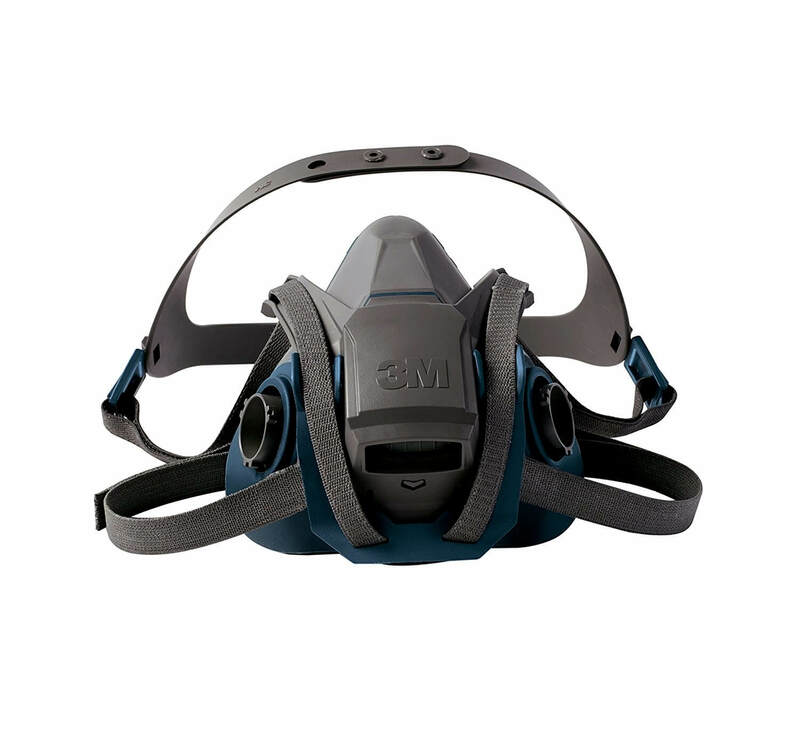 For working with toxic substances – such as lacquers or urea formaldehyde – you can buy a special disposable respirator or invest in a dual-cartridge respirator with disposable filters. Read labels for appropriate filters. Although plastic drop cloths are fairly inexpensive and come in various thicknesses, I would recommend using an actual canvas drop cloth instead. These canvas drop cloths will stay in place and are not as slippery as plastic. You don’t want to accidentally slip on plastic with an open can of paint in your hands! I tend to still use the plastic drop cloths to cover things like furniture and plants, etc – especially when painting ceilings. Whether you’re working inside or outside of your house, the proper use of ladders is one of the most important and common aspects of house painting safety. 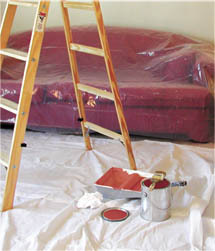 Most interior walls and ceilings can be reached easily with a stepladder. Opened out to a level floor with its spreader braces and its bucket shelf locked into place, a stepladder makes a stable workstation. If you stand below the top two steps and refrain from reaching too far to the left or right, you’ll be reasonably safe. Caution: Never set up a latter in front of a close, unlocked door. Either open the door so that people can see the ladder, or lock it so that no one can inadvertently barge through and knock into the ladder. When working outside against your house or any other building like a separate garage or shed, there is a safe distance to erect the ladder from the building. See the Figure on the right. The basic rule of thumb is to keep the base of the ladder out one foot for every four feet of height. The most common type of accident occurs when the ladder tips over sideways. These accidents were caused by reaching out too far to one side resulting in an unintentional movement of the ladder. Use a ladder of proper length to reach the working height you need. Before you use a single, extension or stepladder outside, make sure it will not hit electrical wires or tree limbs when extended. Place the feet of the ladder on the ground firmly and even. The ground may be very bumpy because of the freezing and thawing during the winter. There also could be soft, muddy spots. The upper and lower sections of an extension ladder should overlap to provide stability. Face the ladder while climbing and stay in the center of the rails. Do not lean over the side of the ladder. Your belt buckle should not be further than the side rail. Stand at or below the highest safe standing level on a ladder. For a stepladder, the safe standing level is the second rung from the top, and for an extension ladder, it’s the fourth rung from the top. Over recent years, ladder manufacturer’s have come a long way in providing us with various types and styles of ladders that can conform to stairways and create a number of positions to suit almost any job. Personally, I own a number of ladders, from the small stepladder to the traditional long extension ladders. My favorite is would definitely be the Little Giant Ladder. I’ve owned my 22 Foot Model for over 8 years now and I admit that it has basically replaced all of my other ladders! You can click on the images below to get more information on the Little Giant Ladder and it’s accessories. When I purchased my Little Giant Ladder, I also included the Wing Span Accessory, the Leg Leveler Accessory and the Work Platform Accessory. All of these are invaluable when it comes to painting both inside and outside of the home. For instance, I use the Leg Leveler Accessory when placing the ladder on uneven ground or even to placed on a step (one leg on a lower step). 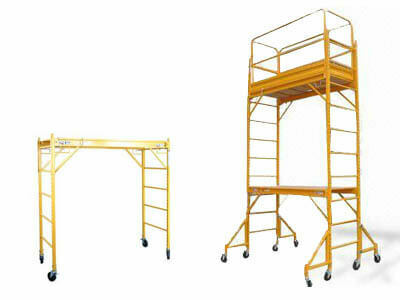 The Work Platform is rated to support up to 300 pounds. Their unique design allows it to tuck away when not needed yet easily moves into place with your foot when needed. When working around windows, rain gutters, bushes, overhangs and other obstacles, the Wing Span’s extra width and individually adjustable legs add even more versatility to any of the Little Giant ladders. I have recommended this ladder to all of my friends and family as well. For working on large ceilings or high walls, scaffolding becomes more efficient than a ladder. A length of planking firmly placed between a step stool and a stepladder gives you safer lateral range than a ladder alone, and it doesn’t have to be moved as frequently. You can buy scaffold boards (1-foot wide x 2 inches thick x 8 feet or longer) at lumberyards, or you can rent them from a paint store or home center. These sturdy planks rest safely on sawhorses, ladders, steps, and landings or on a combination of supports if a few rules are followed: The board should extend at least 1 foot beyond each of its freestanding supports. If the span between supports is 5 feet or more, put a second board on top of the first for added strength. For spans longer than 10 feet, rig an additional support in the middle. Use C-clamps to hold planks firmly in place. Reaching the ceiling and upper walls of a stairwell usually require more elaborate scaffolding. An improvised combination of an extension ladder, stepladder, sawhorses, and planks – with a few cleat boards nailed down for safety – can make the most remote surfaces accessible. Check our exterior painting tips for more ideas.